Boulder Dermatology - BOTOX Vs. Dysport: What’s The Difference? For decades, BOTOX® injections have been used to minimize the appearance of wrinkles and fine lines on the face, neck, and other areas of the body. Due to recent technological advancements in the skincare industry, skincare professionals are now able to offer alternatives like Dysport®, which is favored by many patients at our Boulder dermatology clinic. But what exactly is the difference between these two anti-aging treatments? In this blog post, our skincare specialists at Kallgren Dermatology Clinic will explain how these treatments work and what their benefits are for wrinkle reduction in women and men. Before we dive into the differences between BOTOX and Dysport, it’s important to have a solid understanding of what BOTOX injections are, as well as how they work to minimize wrinkles for smooth, radiant-looking skin. Essentially, BOTOX is a prescription medicine derived from the bacterial toxin botulin, which is a powerful neurotoxic protein that has many medical and cosmetic applications today. In the world of skincare, BOTOX is commonly used to remove the appearance of wrinkles, fine lines, creases, and other skin imperfections by temporarily paralyzing the underlying muscles. When administered by an experienced dermatologist, BOTOX is safe and can produce amazing results. In fact, BOTOX Cosmetic was first approved by the FDA in the 1980s as an effective way to treat wrinkles (in small doses), and it has since been approved by the FDA to reduce frown lines between the eyebrows, forehead lines, crow’s feet, and many other cosmetic signs of aging. BOTOX also has many therapeutic benefits, such as reducing eyelid spasms, chronic migraines, and neck, shoulder, and hemifacial spasms. At our Boulder dermatology clinic, we regularly treat patients with BOTOX injections, leaving them looking and feeling young again. We begin our process with the powdery substance diluted in saline, which we carefully inject into the neuromuscular tissue using a very fine needle. The BOTOX chemical works to block nerve signals from communicating with the muscle causing the wrinkles, ultimately allowing the wrinkles to relax and smooth out on their own. Our dermatology physicians are extensively trained in administering BOTOX injections, and the procedure should last no more than several minutes. This anti-aging treatment is non-surgical and very rarely causes patients any pain, so they do not require anesthesia. BOTOX begins to work approximately one to three days after the procedure, and it could take up to a week for results to show in full. The outcome of BOTOX treatment is a smoother look with fewer wrinkles and a youthful glow, which can last up to half a year. BOTOX injections are not permanent and can be administered on an as-needed basis when wrinkles start to reappear. Over time, the muscles may “learn” how to relax by themselves, leaving you with fewer wrinkles and fine lines the more you invest in BOTOX treatments. 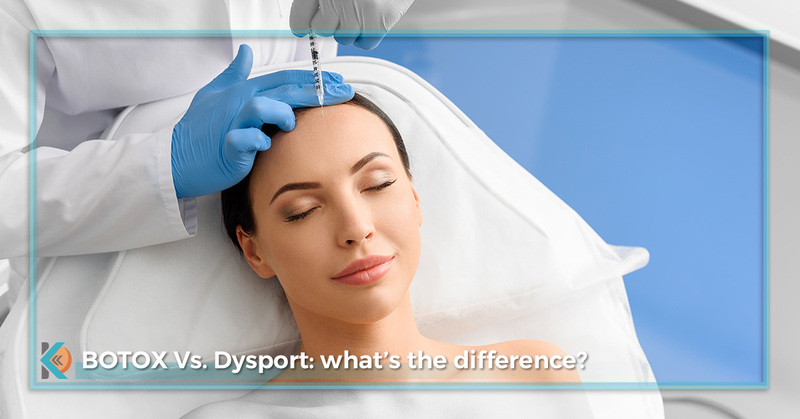 Similar to BOTOX, Dysport is another botulinum toxin medication that is administered via injection into the facial muscles in order to reduce fine lines and wrinkles. However, Dysport is only used to treat the area between the eyebrows, called the glabella. Fine lines in this area are vertical and are more prone to develop in people who frown or squint frequently, which are typically older adults. As with all other facial wrinkles, these lines form naturally over time and become more prominent with age. As the skin loses elasticity, these forehead lines will have a harder time relaxing. But don’t worry — that’s where Dysport comes in! While BOTOX is available to almost anyone over the age of 18 (some use it as a preventative measure), Dysport is only meant for people who have significant glabella wrinkles. These patients are usually men and women above the age of 40, and many of them seek Dysport as a non-invasive wrinkle treatment for the glabella area in specific. Dysport only treats fine lines between the eyebrows, so other facial muscles will not be affected by the treatment and you’ll be able to talk, laugh, and express yourself normally. If you have moderate to severe glabella wrinkles and are interested in pursuing Dysport as a temporary treatment option, contact our Boulder dermatologists to see if you’d be a good candidate for the treatment. Like BOTOX, Dysport injections are administered at your local dermatology clinic by a licensed skincare professional. Mild anesthesia is offered, though many patients find this anti-aging treatment doable without medication. Typically, about five injections are administered in the brow and forehead area by your dermatologist, and the procedure only lasts a few minutes, with most patients only enduring minimal discomfort. In fact, 97 percent of patients say they would happily use Dysport again, as these injections greatly lessen the appearance of glabella lines for several months at a time. Even more significant is the fact that between 2004 and 2014, male Dysport patients grew exponentially, making it one of the best anti-aging options for middle-aged American men. If you are interested in Dysport as a non-invasive anti-aging treatment to target those stubborn lines between your eyebrows, we’ve got you covered. At Kallgren Dermatology, we offer Dysport treatments for men and women, and our dermatology physicians would be more than happy to provide you with a consultation to see if you would benefit from this treatment. We also offer Dysport at a cheaper rate than the cost of BOTOX, so you’ll be getting a great deal when you choose Kallgren Dermatology Clinic in Boulder. At Kallgren Dermatology Clinic, our experienced skincare professionals are dedicated to helping clients look and feel their best. Whether that means administering BOTOX injections, face fillers, or varicose vein treatments, we’re here to care for you while optimizing your skin’s health. Check out our complete list of dermatology treatments here, or visit our website for more information. Our skincare sales always go fast at Kallgren Dermatology Clinic, which is why we advise clients to make their reservations ahead of time. We are only running these Dysport and BOTOX sales while supplies last, so be sure to schedule your appointment with us before they’re all booked! Just consider it a Valentine’s Day gift for yourself. Never done injections before? Curious about the benefits, the cost, or potential side effects? Don’t worry! If you’re new to BOTOX or Dysport, we’d be happy to provide you with a consultation before scheduling your first appointment. Wondering if these non-invasive wrinkle treatments are right for you? Contact our skincare specialists in Boulder to learn more! We look forward to hearing from you.